This great review will be in our October 2011 Model Airplane News magazine. Here’s the first look at this nice aircraft. Everyone instantly recognizes the F-16, as it is one of the U.S. Air Force’s most popular jet fighters. It’s a single engine multitask day weapon, and in its red, white and blue “YF-16 prototype” paint scheme, it was a very attractive and patriotic challenger against the Northrop YF-17 during the early fly-off competition for the military production contract. As soon as I opened the box I could see that ElectriFly had done General Dynamics proud with its recreation of the F-16 Fighting Falcon. This is a true ARF, and all the parts and pieces fit together extremely well. This new generation of electric-powered ducted fanjet ARFs is becoming extremely popular, and the F-16 is certainly going to attract a lot of new potential jet pilots. 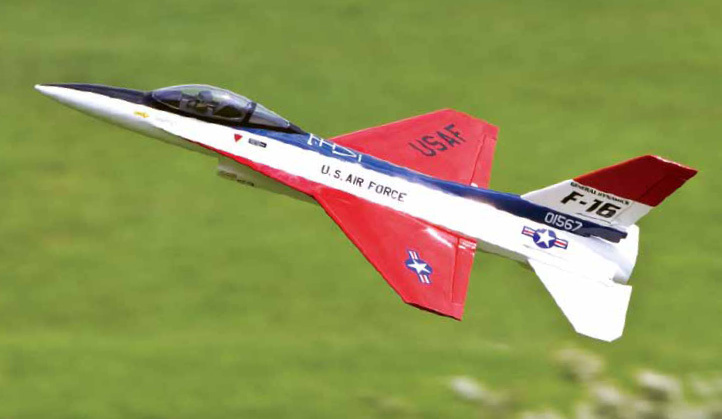 What’s great about this model is that it is very easy to assemble and it has a very attractive flight envelope. It can fly in the 100mph range, but its simplified no-landing-gear approach and use of affordable power components make it affordable and give it a pilot-friendly Unique Features Distributed by Great Planes, the ElectriFly F-16 is a true ARF requiring a minimum of involved assembly. It comes with a beautifully molded and painted fiberglass fuselage, and the built-up-wood wing panels and control surfaces are all finished in MonoKote. The kit also includes the motor and the electric ducted fan (EDF) unit as well as a full hardware package. Also included are a wooden building/transport stand, a stabilizer assembly/ alignment jig and a bungee launch system. All you have to supply is a radio system, servos and extension leads and Y-harness and a suitable battery pack. The F-16 can become airborne two ways: with a good overhead hand-launch or with the use of the included bungee launch system. Two pieces of grip tape are provided that you stick to the sides of the fuselage. They should be placed as shown in the instructions for a firmer finger grip. For bungee launching, the kit includes a launch hook similar to a glider high-start hook, and it threads into a blind nut in the bottom of the fuselage. Be sure to use thread-locker to ensure the hook stays put. With a hand-launch, give the F-16 a firm and forceful launch with the nose at about 30 to 40 degrees up-angle. This will allow the jet to arc slightly downward to gain airspeed and then begin to climb with a slight touch of up-elevator. For the bungee launch, grasp the jet underhand and release it with an upward throw with the model’s nose at a slight up-angle. With either technique, use full power. Keep the wings level, launch directly into the wind and maintaining a shallow climb rate until the airspeed builds up. Though I have not had a lot of EDF jet experience, the new ElectriFly F-16 has opened up my RC horizons a bit. Don’t confuse this beautiful jet with a cheap foamie flyer! It is a real RC airplane, and it looks and flies great. Even though it is a relatively easy build, you should be an experienced RC pilot, as it really delivers jet performance. There is no doubt about it, this F-16 has WOW appeal. Go ahead, strap yourself in; it’s going to be an exciting ride! Wing loading: 30.36 oz./sq. ft.